Halloween Strawberries is rated 5.0 out of 5 by 4. Rated 5 out of 5 by Tina7 from Great Halloween Gift I bought the strawberries and the apple pie as a Halloween gift to my daughter and son-in-law and they loved both. Thank you very much. Rated 5 out of 5 by Sabine5 from Well done!!! Perfect gift! Arrived on schedule and was very much surprised and appreciated by the recepient!!! Rated 5 out of 5 by Anonymous from Ordering was very easy and straightforward with the ability to pick the delivery date, which is great when sending a birthday gift. My recipient said that his Halloween themed chocolate covered strawberries were huge, clearly gormet, and absolutely delicious! Great experience all the way around. These irresistible treats are ghostly good! We've taken our signature, perfectly ripe strawberries and gently dipped them by hand into baths of our exquisitely smooth imported Belgian chocolate. 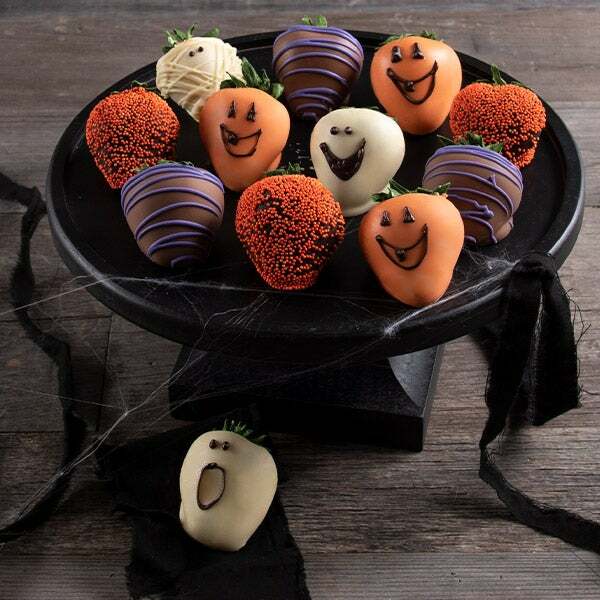 Each fruit is then elegantly embellished with tiny nonpareils, ribbons of our signature silky confectionary drizzle, or adorable Halloween-themed designs.